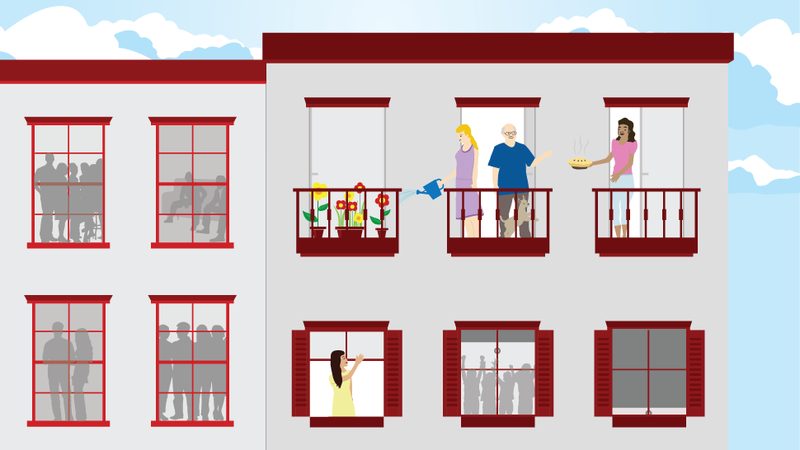 Whether you live in an apartment or a house, being a good neighbor is not only, well, a "neighborly" thing to do; it’s essential to your own happiness. As a psychologist and motivational speaker, I know all about how community relations can affect your well-being — that’s why I’m here to answer all your questions about how to positively develop them, how to mediate tricky situations with difficult neighbors, and, ultimately, how to be the best neighbor you can be. Below are a few tips on how to live in peace and harmony. Ask your neighbors what their day-to-day routines are like (for instance, are they early risers?) – and share yours, too! This way, you all have a better idea as to when it’s best to play music, dance, hang paintings, or argue with your spouse without driving the neighbors crazy. If you have kids, dogs, or big feet, place a rug on the floor in areas where these activities take place. Oh, and if the aforementioned dog soils the elevator, building, or even the entrance — clean it up (this should be a no-brainer —but it turns out that common sense isn't always common...)! Your house and grounds should be as neat and clean as your neighbors’. Yes, it’s your property, but remember, you share a community. It takes many beautiful houses to develop a neighborhood’s reputation, but it only takes one poorly-kept plot to lower property values for everyone. If you have an elderly neighbor who cannot keep up their home, align with other neighbors and pitch in to help with minor upkeep. It can help you develop unexpected friendships, and makes the neighborhood more beautiful as a whole. Lifehacker's Better State of Living Conversation Series is brought to you with the assistance of State Farm®. Today, Dr. Jeff Gardere (a.k.a. "America's Psychologist" ) is in the discussion section below, ready to answer all questions about how to be a great neighbor (and deal with those who aren't).